The counterpart to the radically rugged Olympia X Moto Jacket or Olympia Expedition Jacket, the Olympia X Moto Pants utilize Olympia’s 2 Layer System and Mega Vent Panel System to adapt to the needs of the road or trail. With ergonomics to match their weather protection, the Olympia X Moto 2 Pants are able to be worn comfortably as overpants as well as standalone riding pants. Layer One - consists of a rugged 500D and 2000D Cordura shell for maximum abrasion resistance. Olympia’s Mega Vent Panel System allows the X Moto 2 Pant to transition from solid body, to adjustable airflow construction in seconds. Front thigh vent panels lay flat when placed into self-storage pockets positioned below the knees. Standing, boot on entry is a snap as side leg zippers extend all the way to the waistband. Three-tier adjustable knee armor positions, stretch waist panels and EZ hem bottom detail allows riders to achieve a customized fit. Two front zipper pockets and two rear stash pockets offer secure storage for personal items. Washable leather reinforcement panels run from the inner thigh to the bottom hem. Layer Two - offers a fully functional AquaRes laminated rain pant that is sized to fit over or under the main outer shell. Generous leg openings with an adjustable VELCRO® brand closure system makes standing boot-on entry a breeze. An elasticized waist with side waist slide buckles help riders achieve a customized fit. Bought these pants a couple weeks ago as a replacement for my old all season riding gear. Since I live in the Chicagoland area it's quite hard to make the right decision in regards to which gear you need to buy. Right now I can say that these pants keep me warm in 40°F temperatures even at 70mph on the highway. I can't say how it will be in the summer time but if it gets too hot I still have the AirGlide 4 as an alternative. My only complaints about these pants right now are the protectors. The hip protectors are only stiffer foam and not even worth to mention. The knee protectors are CE level 1 but luckily quite flexible. A replacement set will cost around $70 - which is quite a hike. I'm 5'9" with 190lbs and I wear a 34/34 in jeans. I bought a 34 in these pants and they fit perfectly. I can wear them as over-pants over my business pants but over a pair of jeans it's too snug. The rain liner is a good and welcomed add-on. I can't wrap my head around the idea of wearing the rain liner under the main pants. What benefit do I get of wearing the rain liner under the main pants? I will carry the rain liner with me and only pull them over my riding gear when necessary. I really like the interior liner of these pants and also the way how the knee protector pockets are designed. With my old riding gear I wasn't able to ride without wearing full length undies because of rash areas at the knees and here I don't have any problems. Also these pants don't stick to my legs even after hours. My old pants were horrible. Also the long side zippers are a big plus. They help a lot getting in and out of these pants - even with adventure boots on - and will mostly also become handy on 90+ days when having a break on trails. Overall I'm really pleased with these pants and I'm happy that I took my time for searching around before making my decision. Yes they are a little bit expensive and you need to buy better protectors afterwards but compared to other brands I think they are ok. I really like the thought put into these pants. In cold weather, all zips up, maybe the rain cover over them (can be worn inside too but I have never understood that theory) and a heated liner-all set. In hot weather, you can drop one side of the zipper panel on the front, or open completely and tuck the flap inside the pant leg. Ventilation on these pants are excellent. I wish they would have added a panel on the back as well would be my only improvement. The best astronaut pants you can buy for this price. Pros: I feel like I'm impervious inside my own private bunker. Easy to put on over pants and if you're already wearing boots. I've worn mine while riding highway speed at 27°F, and cold was not an issue. Cons: Feels like I'm wearing big bulky snow/astronaut pants. Takes a while to get them on if you wear the rain liner inside. The rain liner isn't particularly breathable. I had to upgrade to D30 armor because the armor and padding that came with this didn't inspire confidence. Have to incur the extra expense of bringing them to the tailor, and there isn't a tailor in my area. I have a 35" waist, so I got a size 36, and they feel like maybe I should have gotten a 34. Overall: I'm glad I bought these last fall. I got to ride through the winter because of them. But I'm not sure how much I'm going to wear them once the summer comes around. The size 36 is just too bulky. I would have to buy a second pair in size 34 for summer time use, and that's too much money to spend when I wish I had gotten one pair that would have been equally good for summer and winter. Excellent. Very satisfied. Used this product in hot and cold weather. I normally ride without the rain liner, but the liner (easy to store in a jacket pocket) really helps in cold weather. A bit uncomfortable below the knees in hot, dry weather (90+), but thigh ventilation is fine. Humidity, heat, and these pants probably not a good mix. Thigh vents easy to use and tuck away nicely and, with some trouble, can be taken out and zipped up underway. Look great with nice pewter/black color combo. I'm 6' 3'' 200lbs 32' waist and bought size 34 to wear over trousers and the fit is great. Length is also great. Knee pad placement tends toward the inside but this is more an issue of protection than comfort. The best feature is the side zippers in the legs that go clear up to the waist, making them extremely easy to take on and off when worn w/o rain pant. The ease of putting them on means that I wear them every ride---what good is safety gear that you don't wear because it's a hassle to put on? I also have two Olympia jackets and am very pleased with Olympia quality. I have the jacket that matches the pants and absolutely loved it. So I decided to get the pants as well and theyre just as awesome. Havent got to try them in super hot weather yet but for cold and rainy pacific northwest theyre amazing. Hopefully just as good in the hot as the jacket is. Olympia is really making outstanding products and you cant go wrong with the X Moto 2 for 4 season riding. Nice pants, but too pricey. I bought these pants because I also bought the Olympia X Moto 2 Jacket and thought I might as well get the matched set. I don't believe they are worth the price I paid. I ordered a larger size than I normal wear so I could wear them over my normal work clothes for when I commute. I probably ordered a size too large, but since they have belt loops I just use a belt with them to hold them up. I have the High-Viz jacket and wished the pants had some High-Viz components to them also, but they are just grey and black. The Mega-Vents are nice in warmer weather, however since the vents only exist on the front side of the pants you don't get as much of the cooling effect as you get in the jacket with the Mega-Vents on the front and the back. I love the fact that the side zips go from ankle to nearly the waist. This makes it easy to get them on and off over my boots and work clothes. Overall they are great pants. There's a few things that could be improved, but they aren't worth the nearly $350 I paid for them. I mean, come on, look at all you get on the Olympia X Moto 2 Jacket for slightly more than the cost of these pant. 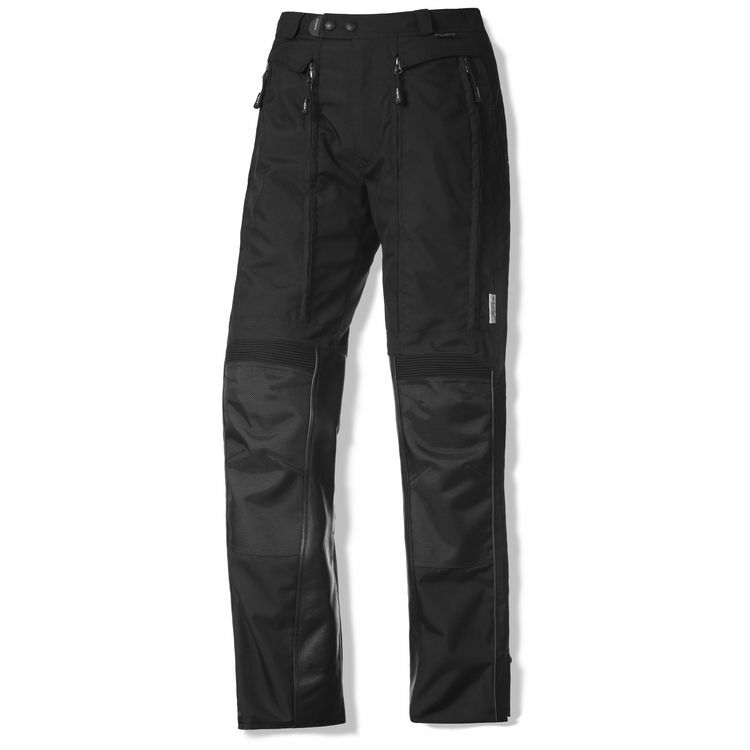 These are the vary best quality all weather pants that I have ever owned. I like them a lot. I ride each and every day, rain or shine, and ride right up until we hit freezing temperatures. I couldn't be happier with the quality and the feeling of protection that these pants offer. They might be a bit warm for the really hot summer climates like those of the death valley area. The tailor to you own length feature is a welcome thing and my wife made short work of that. I went with the Olympia brand after my wife bought several pair on sale and I saw how well they were made. Here's a simple review: Engineered to perfection! If you wear a size 40, like I do, but plan to wear these riding pants over your office pants, jeans or shorts, order a 42. I have just the right amount of breathing room with office pants under these. The pants are extra long, and my master seamstress wife is going to hem a couple of inches off the bottom. They are designed this way on purpose. If you have a true 36" inseam, you won't need any alterations. Looking for a 4 season pant for long distance riding. I have other Olympia products that I am happy with. Good airflow, beefier than the Dakar pant, plus water resistant liner/outer pant. Matched the jacket. I have shorter legs so I like the easy hem, and how big the vents are. Peter H. from Revzilla recommended this product over email to me. Peter was very helpful. if the moto quest jacket is awesome, these should be the same. 1st time buyer. I wanted some high quality riding pants that meshed well with my Olympia Jacket. The fit was perfect, very happy with my X Moto 2 pants. Have been looking for a while for a pair of pants for dual sport/ adv that I can wear all year round- especially summer. Moto x pants are no good on the road. Needed additional pants for cooler weather. Have the same pants in size 34, but they are to a little to large. The size 34 are sized ok when wearing over insulated jeans, or insulated long insulated biking pants. Ordered the size 32 to wear when wearing only a thin pair of shorts, usually in the summer. Compliment the Olympia Expedition Jacket. Matches my X Moto Jacket. I like the ventilation and waterproof capabilities. Best rating online for over pant. I've had the Olympia Expedition "4-season" jacket for a year and really like it. Wanted riding pants and because I am impressed with Olympia's "4-season" jacket thought I would check out their "4-season" riding pants. I chose these pants based on a combination of my satisfaction with my Olympia jacket and the reviews on the Olympia X Moto pants. can I replace the armour in the hip with a higher rated CE and what size? Will the legs fit over ADV boots? Yes. I wore Forma brand ADV boots no issue. How are these if you have to stop and use the restroom? BEST ANSWER: 2 snap buttons and a zip- just like undoing a pair of jeans. the rain pants are similar to your typical pullover, elastic waist rain pants. If #1 no problem, there is a zipper. If #2 then u have 2 pair of pants on, just drop them both. That's if ur wearing as over pants. Do you have to remove your boots when you put the rain liner on over the pants? BEST ANSWER: No, it's a little tight and requires some extra effort like putting a sock on a wet foot, but worth it for the warmth. I leave the liner in my closet and have been through 8 Midwest summer downpours and a few spotted showers, my pants have been slightly damp (I've been more damp walking in high humidity) at most and dry by the time I get off the bike. Just enough to keep you cool while full gear. I would leave the mesh vents closed going through rain, but the liner I'd only use for the wind resistance. Take it with on road trips just in case. Thanks for your input. I just ordered these for our ADV. ride across Colorado. Well, it depends. The bottom of the legs are way flared out like bell bottoms with big strips of velcro to fold over and secure them. I suppose if your boots weren't huge plastic off road boots and flex a little at the ankle you should be fine. Honestly I've never stopped to put them on as overpants though- if it's raining when I leave I use them as liners, if I get caught in the rain without em, oh well. No you do not. The pants and rain liner can go on over your boots and jeans, no problem. Will these pants work with the Olympia Expedition jacket? Thanks a lot for getting back to me, much appreciated. What is the standard i seam they come with? Thank you in advance. So then i am understanding the inseam of the pants is 33. What is the standard inseam of these pants? BEST ANSWER: I would say they are about 34” inseam. I bought a size 40 and usually get a 32-34 inseam on most pants. These have a slight bunch up around the ankle for me. Hope this helps. Do these connect to the Olympia Bradley jacket? BEST ANSWER: No but you have 6" of hem-ability below the zipper.